My high school in Erie, Pa., has one that has been hanging in the back of the art room for years. Students use it to draw and sculpt and learn about anatomy. 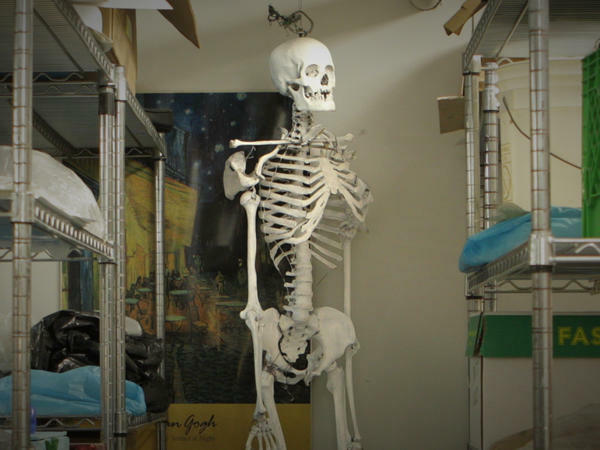 For this episode of Skunk Bear, teachers and administrators let us borrow the skeleton. We then used a bunch of scientific tools — usually applied at crime scenes and archaeological digs — to investigate this person's past: Who was this person? And where did the bones come from? Many high school science or art rooms have a human skeleton hanging next to a chalkboard or by the teacher's desk. Many of those skeletons are made of real bones. Reporter Elissa Nadworny of the NPR Ed team had one in her high school in Erie, Pa., and she set out to find out whose bones they were. ELISSA NADWORNY, BYLINE: Many of these skeletons around the country have names. There's Mr. Bones in New Mexico, Lord Dooley in North Carolina and Courtney in Rhode Island. The one at Northwest Pennsylvania Collegiate Academy where I went - it doesn't have a name. But it does have a story, and I wanted to know it. So I brought Adam Cole, the science reporter behind NPR's Skunk Bear video series, back home with me to Erie. ADAM COLE, BYLINE: Nice Cafeteria. NADWORNY: That was our lunch table, corner table. NADWORNY: Music classes are down there. NADWORNY: Wow, oh, my gosh, just hanging up there. In the back of the classroom - our skeleton. COLE: He's really strung together. NADWORNY: Mrs. Leasure has been using it to teach ceramics. She says its way better than a plastic reproduction. KIM LEASURE: It's much more real, real life. NADWORNY: But where is it from? LEASURE: I have no idea where he came from, but he was passed down from art teacher to art teacher. NADWORNY: Did she know how long it's been here? LEASURE: It could have been here for a hundred years. NADWORNY: We asked the principal, James Vieira. JAMES VIEIRA: The lore is that it came from Ganges in some type of accident or washout. We consistently hear that its male based on the bone structure. NADWORNY: So the question is, is that story true? NADWORNY: The folks in Eire let us pack up the bones so we could investigate. The more I researched human skeletons, all the clues pointed to India, where for decades there was a somewhat shady but legal trade in human remains. It started in the mid-1800s. SCOTT CARNEY: At its height, Calcutta was exporting about 60,000 human skeletons every year. NADWORNY: That's Scott Carney. He's an expert on India's bone trade and the author of "The Red Market." CARNEY: These are the poorest of poor people in the world. And when they died, then their bodies were sold. It was a horrendous situation. NADWORNY: And yet the legal trade persisted until the 1980s. So our skeleton could have come from the Ganges region like the principal thought. But we needed science, so we took the skeleton to Mercyhurst University, to a bunch of forensic anthropologists. And we consulted with the Smithsonian and sent a small sample of the bone to a lab at Penn State. After about four months, we got the result. NADWORNY: I called Principal Vieira and Mrs. Leasure to fill them in. NADWORNY: So I want to just tell you what we heard back. VIEIRA: We're excited. I was wondering the other day. Like, when am I going to hear back? NADWORNY: The first thing I tell them - it's a female. NADWORNY: She died in her mid-20s and was about 5'2". And her ancestry - probably Asian. NADWORNY: From the chemical signature in her bones, she ate land plants and animals, not things like corn or fish, which means she lived somewhere continental like India. And so then the final analysis we did was - they carbon dated the bones to find out how old they were. NADWORNY: I tell them it's most likely that this person lived from 1875 to 1920, which fits right in that bone trade timeline. VIEIRA: Holy cow - pretty amazing what you can find out. VIEIRA: It becomes, you know, a person more than just an object. I think that's the part that's like kind of freaking me out a little bit. NADWORNY: So like a lot of schools with skeletons like this, my old high school faces a decision. Should they bury it like a school in the U.K. did or continue to use it as a teaching tool? Perhaps it's a question for the students. What is our moral obligation to these bones? Elissa Nadworny, NPR News, Erie, Pa.
CHANG: You can see Nadworny's high school skeleton and learn about the science behind her discovery at youtube.com/skunkbear. That's one word. Transcript provided by NPR, Copyright NPR.